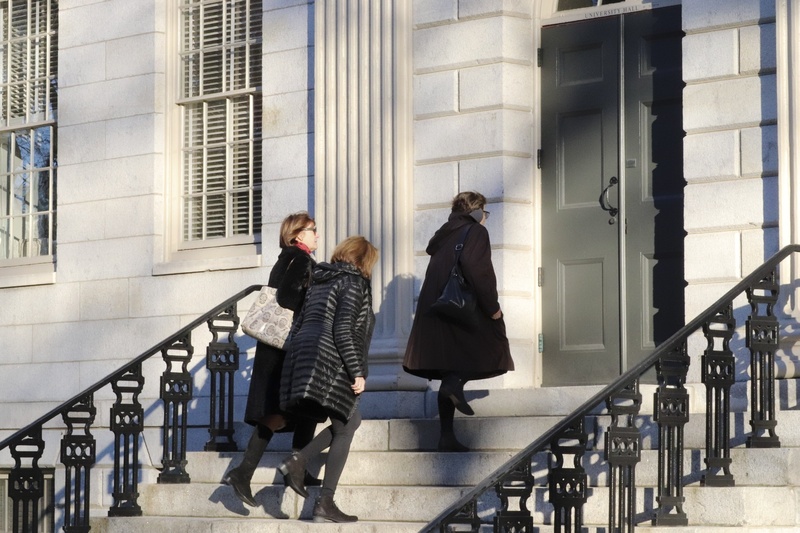 Faculty members enter University Hall for the December 2018 Faculty meeting. Bacow has taken five trips to Washington in the past eight months to lobby on behalf of the University’s interests and higher education issues more broadly, he said during the “President’s Business” portion of the meeting. Among the various topics he has discussed with Congress is the continuation of Deferred Action for Childhood Arrivals, an Obama-era initiative that allows undocumented youth to legally live and work in the U.S., and an “unprecedented” tax on large university endowments set to be levied for the first time this fiscal year. Bacow added he has been advocating in particular for Jin K. Park ’18-’19, the first DACA recipient to win a Rhodes Scholarship, who may not be able to return to the United States after he embarks for England in the fall. President Donald Trump moved to repeal DACA in September 2017, but federal judges in California, New York, and Washington, D.C., have blocked his efforts, allowing recipients to remain in the country temporarily. U.S. Citizenship and Immigration Services began preventing DACA recipients from traveling abroad for academic study in 2017. The University has “connected” Park with legal counsel from WilmerHale, which is representing him pro-bono, according to Bacow. He added that Park will testify in Congress Wednesday “on behalf of all” the University’s DACA recipients. “I think it will be an important moment in this conversation nationally,” Bacow said. Bacow also said he will travel to Asia next week to meet with government officials, higher education leaders, and Harvard alumni in China and Japan to discuss the “status” of “scholarly collaborations” in which the University is engaged. Faculty members voted on two legislative items — both of which they first discussed in February — after Bacow’s remarks. After a contentious, hour-long debate at last month’s meeting on Comparative Literature Professor Karen L. Thornber’s proposal to establish a concurrent degree program, the faculty overwhelmingly supported an amended version of the legislation. The new program will allow students — starting with the class of 2022 — to obtain a bachelor’s and master’s degree in four years. Last spring, the Faculty moved to phase out the “Advanced Standing” program, which gave students entering the College with the requisite amount of advanced high school coursework the opportunity to earn a bachelor’s degree in three years or a master’s and a bachelor’s in four. Several faculty members took issue with the original proposal, arguing at last month’s meeting that the program as it stood could overburden students, damage the academic integrity of master’s degrees, and disproportionately advantage students who attended elite high schools before coming to Harvard. After consulting with faculty from a “range” of departments, Thornber proposed an amendment at the Tuesday meeting to increase the number of credits students are able to double-count towards both degrees from 12 to 16, in hopes of resolving one source of contention at last month’s meeting. Computer Science Professor Harry R. Lewis ’68 — who argued at last month’s meeting that the requirements as originally proposed would have imposed “too heavy a burden” on students — voted in favor of the amended legislation. Lewis cited Office of Institutional Research data presented by Thornber — showing that more than 10 percent of students already take extra courses each semester — as evidence that concurrent degree students would likely take additional courses early in their academic career, rather than waiting to do so until later. “I actually expect that the students who choose this option early will not do as suggested (start taking 5 courses their fifth term) and will instead take overloads as freshmen and sophomores, so they don’t have to kill themselves taking 5 courses later on while they are taking a lot of grad level courses,” Lewis wrote in an email. Though Thornber conceded the proposed program constituted an “imperfect compromise” between the positions faculty expressed at the February meeting, she said it remains “our best hope at preserving a concurrent master’s.” She added that individual departments will have the option to opt out of the program. “Many of Harvard’s departments offer the dual degree option as a way to give students necessary professional credentials helpful in a number of fields, to recognize the completion of extra advanced coursework, or to recruit the best and the brightest,” Thornber said. Faculty also voted unanimously to change the name of the Visual and Environmental Studies department to the Department of Art, Film, and Visual Studies.